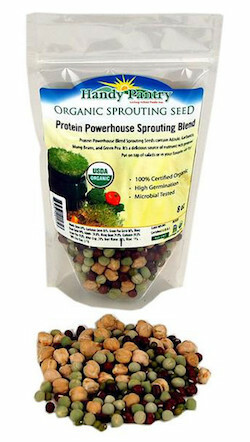 This high protein mix of sprout seeds includes adzuki, green pea, mung and garbanzo for a delicious, high protein sprout feast! A must to supplement protein intake for vegans and those on a raw food diet. Directions: Soak beans 10-12 hours in 4 parts warm water (not hot) to 1 part seed; change water once during the soaking period; rinse well and drain. Spread evenly in your sprouting container. Sprouts MUST be rinsed and drained well 3 times per day during the growing period. Cover the container to keep out all light. Beans like to be kept warm and grow best at 75�-80�F. When grown in this manner they should be harvested when the sprout is approximately 1" long and before they develop any leaves. rinse hulls to prevent fermentation by immersing in a large bowl of cool water; separate clumps; let hulls float to surface and skim off. Ingredients: certified organic adzuki, garbanzo, mung bean and snow pea seeds.